I started a new devotional for Lent today. Yes, I’m aware Lent doesn’t start until Wednesday 🙂 I just wanted some built-in space in case I miss a day. 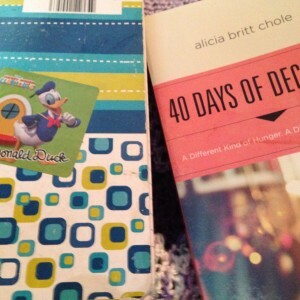 It’s called 40 Days of Decrease by Alicia Britt Chole. Alicia subtitles it “A Different Kind of Hunger. A Different Kind of Fast.” She shares some thoughts along with readings from the Gospel of John (my favorite). I’ve always loved Alicia’s writing style, and this book does not disappoint. Simple. Direct. Probing. Vulnerable. She’s the real deal. The Scripture today was John 12:1-11, a favorite story of mine, where Mary anoints Jesus with a pint of nard. She was in awe of Him, so much so that she humbled/humiliated herself in her worship of Him. One question I walked away with from the first day’s reading is this: are we hyper focused on our sacrifices during Lent, or are we awed by the coming Resurrection Sunday? It’s a reminder to keep my eyes on the resurrection everyday – the promise of a new day, a fresh start. Consider getting 40 Days of Decrease or another devotional for Lent this year. This entry was posted in alicia britt chole, jesus, john, lent, personal growth by Brenna Kate Simonds. Bookmark the permalink.